What is a Salt Glacier? A moving river of crystalline salt. 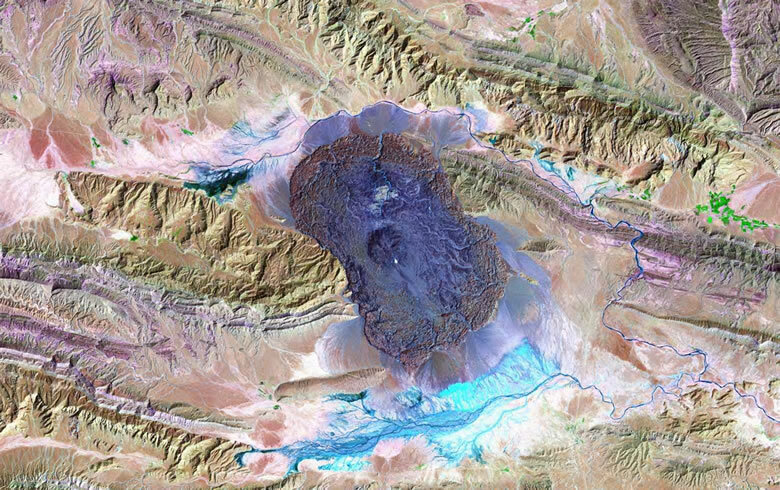 Salt glaciers: Landsat image of two salt glaciers that formed when salt domes erupted from the flanks of mountains in the Zagros fold belt of Iran. The salt glacier on the left is flowing south. The one on the right is flowing north. Each glacier is about four miles long from head to toe. To examine them in more detail (getting close enough to see the crevasses and ridge surfaces), zoom all the way in on this Bing satellite view. Salt glacier: Landsat image of another salt glacier from the Zagros fold belt. This one erupted from the crest of a mountain and is flowing into valleys on either side. In this glacier, a central dome above the salt dome is clearly visible. Examine in detail by zooming in on this Bing satellite view. Salt diapir and salt glacier formation: Steps in the formation of a salt dome and salt glacier. In the Zagros Mountains of Iran, salt domes break through the surface to produce flowing glaciers of salt. The arid climate does not produce enough rain to dissolve the salt and carry it away. Most people are familiar with ice glaciers. They are masses of ice on land that slowly flow downslope or spread laterally like an extremely viscous fluid. Flow occurs because ice has the ability to deform internally and flow in response to gravity. Salt has those same abilities. If a large mass of salt is placed on a slope, it will very slowly respond to gravity and slowly flow down the slope. If a mass of salt is on level ground, it will slowly spread laterally under its own weight. These flowing masses of salt on land are called "salt glaciers" or "namakiers." 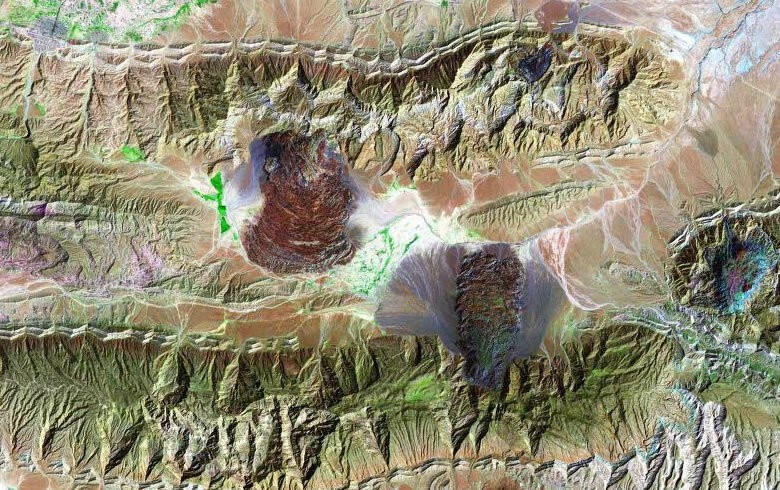 Salt glaciers in Iran: Oblique perspective of the two salt glaciers illustrated in the Landsat image at the top of this page. Their black color is caused by clay minerals included in the salt along with airborne dust that sticks to the salt. Image by NASA. Related: What is a Rock Glacier ? Where Does This Salt Come From? For sustained flow, salt glaciers need a steady supply of salt. Most salt glaciers are fed by a flow of salt from the subsurface. The most common delivery mechanism is a salt dome (often referred to as a "salt diapir") that has pierced Earth's surface. Salt domes form when a layer of salt is deeply buried by other rock units. Salt has a lower specific gravity than most other rocks. If it is buried by rocks of higher specific gravity, it will become buoyant. It will attempt to rise through the overlying rocks like a bubble of air through a bottle of shampoo. As soon as the salt starts moving upwards at one location, the pressure of the overlying rocks on the rest of the layer will squeeze the salt towards the location where upward movement has begun. This forces the salt upwards until it reaches the surface, or until a condition of equilibrium is established. If it breaks the surface and upward movement continues, the salt flows out onto the surface to form a salt glacier. Subsurface seismic record of salt glaciers in an extensional intracontinental setting (Late Triassic of northwestern Germany): Markus Mohr, John K. Warren, Peter A. Kukla, Janos L. Urai and Anton Irmen, Geology, Volume 35, Number 11, Pages 963-966, November 2007. 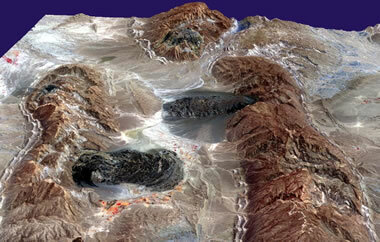 Iran's Salt Glaciers: NASA Earth Observatory, Image of the Day, January 27, 2004. The flow of salt glaciers: D. D. Wenkert, Geophysical Research Letters, Volume 6, Number 6, pages 523-526, 1979. Salt Glacier and Composite Sediment-Salt Glacier Models for the Emplacement and Early Burial of Allochthonous Salt Sheets: Raymond C. Fletcher, Michael R. Hudec and Ian A. Watson, a chapter from Salt Tectonics: A Global Perspective, AAPG Memoir 65, pages 77-108, 1995. The Onion Creek Salt Diapir, Grand County: Carole McCalla, article on the Utah Geological Survey website, January 2008. Salt glaciers are usually very small compared to ice glaciers. A large salt glacier is only a few miles long, while large ice glaciers can be over 100 miles long. Salt glaciers are rare. They only occur where four situations coincide: 1) thick salt layers are present in the subsurface; 2) the salt layers are producing salt domes; 3) the salt domes are large enough to reach Earth's surface; and, 4) the climate is extremely arid to protect the salt from dissolving. A large portion of the world's salt glaciers are found in arid regions near the Persian Gulf. Ancient salt glaciers have been found in the subsurface. During the Late Triassic, salt glaciers flowed onto the floor of a subsiding extensional basin in the area that is now Germany. This was an area of rapid redbed deposition which buried the salt glacier. Further extrusion of salt and burial by sediments produced a series of superpositioned salt glaciers preserved in the rock record. They were discovered and first documented in 2007 after a seismic survey was done in the area. Salt glaciers sometimes develop over faults. These faults may have triggered salt dome development. Allochthonous salt sheets in the northern Gulf of Mexico were produced during the Miocene when salt glaciers flowed out onto the floor of the Gulf and were preserved by sedimentation. A salt glacier in Utah has inspired the name of a creek that flows over it. The name "Onion Creek" was given because an aroma of sulfur (from the salt dome cap rock) fills the air.